Over the last 30 years, numerous scientific publications have described the design, construction, testing, and characterization of diverse whole-cell bioreporter strains for the detection and quantification of organic pollutants. In this chapter we attempt to review these reports, providing the relevant information regarding the sensor strains’ construction principles and performance characteristics, with a special emphasis on the detection thresholds of either specific target compounds or classes of such chemicals. The rapid expansion in industrial, pharmaceutical, and agricultural technologies throughout the past century, often augmented either by the absence of adequate environmental regulations or by the lack of their enforcement, has led to the discharge of high quantities of diverse organic pollutants to the environment. The environmental persistence of some of these pollutants, and their significant deleterious effects on environmental well-being and on human health, prompted a worldwide effort toward their mitigation and remediation. An initial step in any remediation effort involves the careful analysis of the nature of the pollutants, the degree of contamination, and an assessment of the risks it harbors. Chemical analysis, clearly a crucial element in this process, is nevertheless limited by its inability to provide information on the toxicity of a chemical or its bioavailability. As a partial response to this need, different bioassays have been developed to provide the missing complementary evidence regarding availability and biological effects of either specific pollutants or of uncharacterized environmental samples. Such information is essential for assessing the actual risks involved in any pollution event or contaminated site. Aided by the accelerated development of synthetic biology tools over the past decades, cell-based assays have emerged as an attractive option for pollution monitoring. Characterized by ease of growth and maintenance, large and homogeneous populations, low costs, rapid responses, and – maybe most important – facility of genetic manipulations, numerous whole-cell bioreporters have been described in the scientific literature. In this chapter we attempt to briefly review those sensor strains that detect and quantitatively report the presence of organic molecules. We have limited the review to those reports describing sensors of either specific organic compounds or specific classes of such chemicals, thus excluding sensors of general biological effects such as toxicity, genotoxicity, or oxidative stress. The selected reports are divided in the review below according to the chemical class of the target organic molecules; the same classification is also implemented in Table 1, in which the diverse microbial reporter strains mentioned in the present review and their target chemicals are listed. D. chlorelloides, Scenedesmus intermedius, Scenedesmus sp. Aromatic compounds, most notably naphthalene, were among the first to be used as target molecules for microbial bioreporters. Naphthalene, a polycyclic aromatic hydrocarbon (PAH) with possible carcinogenic effects (Boffetta et al. 1997), has been in commercial use for almost two centuries, mostly as a precursor to phthalic anhydride in the plastic industry. Its intensive use and distribution in the environment, along with its adverse health effects to humans (Agency for Toxic Substances and Disease Registry (ATSDR) 2005), promoted the efforts to develop an effective biosensing device for its detection. The first report of a naphthalene bioreporter was published by the Sayler group (Burlage et al. 1990; King et al. 1990). The promoter region of the naphthalene dioxygenase-encoding nahA gene, from the NAH7 plasmid of Pseudomonas putida, was fused to the bioluminescence luxCDABE gene cassette from Aliivibrio fischeri (formerly Vibrio fischeri); the plasmid-borne fusion was then transformed into a P. putida strain, to yield a bioreporter that emitted light in a dose-dependent manner in the presence naphthalene or salicylate. By measuring light intensity, Burlage et al. (1990) were also able to track the rate of gene expression of the naphthalene-associated genes in real time and showed that the rate of naphthalene metabolism was dependent on the culture’s growth phase. This construct was successfully used to monitor the long-term (ca. 2 years) bioremediation process of soil contaminated by naphthalene, anthracene, and phenanthrene (Ripp et al. 2000). Several recent studies applied a similar methodology to construct other naphthalene bioreporters. Sun et al. (2017) used an Acinetobacter ADPWH_lux, a strain in which the luxCDABE cassette was inserted between the salA and salR genes on the chromosome, as host for a plasmid containing the P. putida nahAD operon. This construct was shown to respond to soil and water samples containing naphthalene, but not other PAHs. Construction of an Escherichia coli-based biosensor for naphthalene was reported by Cho et al. (2014). This strain carries a lacZ fusion of the nahR gene promoter, encoding a regulatory element of the naphthalene degradation pathway. By assaying β-galactosidase activity, this strain successfully detected naphthalene in both aqueous and gaseous samples. Benzene, toluene, ethylbenzene, and xylene (BTEX) are major environmental pollutants. These volatile aromatic compounds are found in crude oil, petroleum, and natural gas deposits, as well as in motor vehicles and aircraft emissions and even cigarette smoke. Among these compounds, the water-soluble benzene is considered the most hazardous to humans due to its carcinogenic potential (Wilbur et al. 2008); other members of this family also exert significant deleterious health effects, including damage to neuronal membrane as well as reproductive, respiratory, and blood disorders (Agency for Toxic Substances and Disease Registry (ATSDR) 2004). Some of the early attempts to construct a microbial biosensor for BTEX detection made use of the P. putida TOL plasmid pWWO. This toluene-degrading soil bacterium is capable of degrading toluene and toluene-related compounds to Krebs cycle intermediates (Worsey and Williams 1975; Burlage et al. 1989; Assinder and Williams 1990). The first stage in this process includes the binding of toluene (and related compounds) to the XylR transcriptional regulator, which then allows the interaction of XylR and the Pu promoter region. This activates the transcription of several genes involved in the biotransformation of toluene to benzoate. Another set of genes is then transcribed through the Pm promoter, transforming the benzoate to Krebs cycle intermediates. The Pu promoter, activated immediately upon exposure to toluene, was employed as the sensing element of bioreporters aimed at its detection. One such system was reported by Willardson et al. (1998). The XylR and Pu elements were fused to firefly luciferase and the resulting plasmid transformed into an E. coli host. The resulting bioreporter emitted a luminescent signal upon exposure to micromolar levels of XylR-binding compounds such as toluene, benzene, and xylene. This strain was shown to detect BTEX compounds in aquifer and soil samples. P. putida’s innate ability to degrade BTEX was also used by Applegate et al. (1998). The promoter of the tod operon, encoding several enzymes capable of transforming benzene, toluene, and p-xylene, was fused to the luxCDABE gene cassette in the bacterial chromosome. The resulting strain detected 30 μg/L of toluene and responded to jet fuel residues in aqueous solution. In another report, with E. coli as host and the previously described XylR-Pu as the sensing mechanism, aequorin served as the reporting element (Zeinoddini et al. 2010). This protein uses coelenterazine hcp (a synthetic derivative of coelenterazine) and O2 as substrates. Upon exposure to Ca2+, the coelenterazine is converted to coelentramide, a process accompanied by the emission of an instant flash of blue light. This process is advantageous in that while the accumulation of the protein is a long and steady process, the bioluminescent reaction is very rapid. The detection limit for toluene obtained with this design was lower than 1 μM. A more elaborate design for BTEX sensing, also based on XylR and the Pu promoter, was reported by de las Heras and de Lorenzo (2011a). The Pu promoter and the luxCDABE cassette of Photorhabdus luminescens were fused and randomly inserted into the P. putida chromosome using a mini-transposon delivery vector. A similar method was used to insert a fusion of XylR, and its constitutive promoter Pr, but in an opposite orientation. The resulting microbial bioreporter was then lyophilized and immobilized in gelatin capsules and spread on a soil microcosm composed of a filter paper soaked with m-xylene and covered with soil. By applying water or increasing the humidity in the chamber, the gelatin dissolved, allowing the bacteria to be released to the surface. A bioluminescent signal was observed using a CCD camera after 32–58 h, depending on the cryoprotectants employed during lyophilization. A P. putida strain with a similar design and lacZ as reporter gene, previously constructed by the same authors (De Las Heras et al. 2008), was used as control. Another approach for constructing a BTEX bioreporter was reported by Tizzard and Lloyd-Jones (2007), based on the fact that bacterial degradation of highly reduced hydrocarbons is initiated by oxygenase-mediated substrate oxidation. 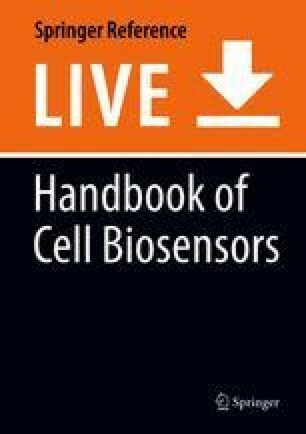 The high specificity, stability, and activity render such oxygenases ideal in vivo biosensing components. The signal output of this system was based on measuring the rate of catabolism, as manifested by oxygen consumption measured using BD Oxygen Biosensor™ plates. The assay measured oxygen uptake by a test bacterium (different strains were used for each analyte) exposed to benzene, toluene, ethylbenzene, and the three isomers of xylene, in comparison to the same bacterium lacking the appropriate oxygenase or in which respiratory activity was inactivated. Using this methodology, 125 μM of toluene were detected in water samples. In a different report by Paitan et al. (2004), the xylS promoter of the TOL operon was fused to either lacZ (β-galactosidase, with p-aminophenyl-β-d-galactopyranoside as substrate) or phoA (alkaline phosphatase, with p-aminophenyl phosphate). In both cases the product of the enzymatic reaction is p-aminophenol, which is oxidized by an electrode and converted to a measurable current signal by use of the chronoamperometric technique. The resulting bioreporter could detect 40–50 μM of toluene and m-xylene within 20–30 min from exposure. Aliphatic hydrocarbons are among the most prevalent environmental pollutants, primarily due to their use as fuels but also through other industrial processes. Significant contamination of soil, air, aquifers, and marine environments by these compounds draws great public concern, due to the adverse health effects reported to occur after exposure to many members of this group (Laffon et al. 2016; Azuma et al. 2018). A microbial biosensor for the detection of aliphatic hydrocarbons was described by Sticher et al. (1997). It consisted of an E. coli host, transformed with two plasmids: one harbored a fusion between the promoter region of alkB, an alkane 1-monooxygenase originating from Pseudomonas oleovorans, to the luxAB genes of Vibrio harveyi, and the other containing alkS, encoding the transcriptional activator of alkB. The resulting strain detected octane concentrations as low as 24.5 nM and exhibited good specificity toward short- and middle-chained alkanes. Another E. coli-based bioreporter, harboring a plasmid containing the P. oleovorans alcohol dehydrogenase alkJ and constitutively expressed V. harveyi luxAB genes, was reported by Minak-Bernero et al. (2004). The alkJ gene recognizes C5-C12 linear primary alcohols and converts them to aldehydes. These, in turn, act as substrates in the luciferase-catalyzed luminescent reaction. To allow detection of octane, the alkane hydroxylase alkBFG genes, also originating from P. oleovorans, were introduced via plasmid, allowing the oxidation of octane to a primary alcohol, which could then be detected by the mechanism previously described. This strain was shown to detect 10–200 μM of octane. A bioreporter capable of detecting longer-chain alkanes and alkenes, reported by Zhang et al. (2012), was based on Acinetobacter baylyi as host. This bacterium, ubiquitous in natural soil and marine environments, is capable of degrading alkanes with 12- to 36-long carbon chains (Ratajczak et al. 1998). The chromosomally integrated luxCDABE genes were controlled by the alkR regulation system. Introduction of several point mutations to the promoter region of alkR shortened the response time. This construct was demonstrated to determine the presence of mineral and crude oils in water, seawater, and soil. The marine oil-degrading bacterium Alcanivorax borkumensis, ubiquitous in oil-polluted environments (Hara et al. 2003), was also employed to detect long-chained alkanes (Kumari et al. 2011). The promoter region of its n-tetradecane- and hexadecane-inducible alkSB1GHJ operon, along with its transcriptional regulator AlkS, was used as the sensing element. This plasmid-based construct was used to transform both E. coli and A. borkumensis hosts, which were shown to detect octane, tetradecane, and crude oil, with the latter strain being more sensitive to low concentrations of pure alkanes and oil (Sevilla et al. 2015). A yeast biosensor for middle-chain alkanes, capable of performing in temperatures as low as 5 °C, was reported by Alkasrawi et al. (1999). Yarrowia lipolytica, a psychrotrophic yeast strain isolated from diesel oil-contaminated alpine soil and capable of alkane degradation, was used as host, and the concentration of alkanes was assayed as oxygen uptake during consumption of the tested chemicals. While less sensitive than the E. coli-based system reported by Sticher et al. (1997), the low temperature capabilities of this sensor may be advantageous under environmental conditions. The detection of nitroaromatic explosives is of high importance due to a combination of humanitarian, security, and environmental concerns. The extensive production of explosives in the past two centuries resulted in vast contamination of soils and aquifers. As some of these compounds, namely, 2,4,6-trinitrotoluene (TNT) and 2,4-dinitrotoluene (2,4-DNT), are toxic and possibly carcinogenic (Agency for Toxic Substances and Disease Registry (ATSDR) 1995, 2016), development of rapid, reliable, and cheap techniques for their detection is highly desirable. Bioreporters have also been suggested as means for the remote detection of buried landmines, thus mitigating the risk for involved personnel. Most landmines produced throughout the past century contain a TNT-based explosive charge enveloped in a metallic or plastic casing. While TNT is the most abundant compound in the explosive charge, it also contains the more volatile impurities 2,4-DNT and 2,4-dinitrobenzene (DNB). These compounds are constantly released from the landmine and migrate to the surrounding soil. Due to its high volatility and stability, 2,4-DNT is considered the tracer of choice for TNT-based explosives and is therefore the target in most reports of explosives’ whole-cell sensors. The concept of a microbial-based system for landmine detection was first described in a patent by Burlage et al. (1999). This system was based on a genetically modified bacterium (the author did not specify the strain, P. putida and Bacillus subtilis were both mentioned in the patent document) sprayed directly on the area containing the landmines. Upon exposure to TNT/DNT vapors transpiring from the buried landmines, the bacterium was programmed to produce a green fluorescent protein (GFP) which could then be detected using UV lamps. While a preliminary success with this construct was reported (MacDonald et al. 2003), no further publications regarding its development were reported to date. Several additional microbial bioreporters for explosives detection were reported throughout the past two decades, employing diverse hosts, reporter genes, and sensing elements (Shemer et al. 2015, 2017). A notable example is Radhika et al. (2007), who harnessed elements of the rat olfactory system, shown to respond to DNT, and inserted them to a yeast strain while coupling their activation to the transcription of GFP. Another interesting approach was reported by Davidson et al. (2012), who used a riboswitch, an aptamer element in the 5′ untranslated region of some RNAs that can bind specific target molecules. The aptamer binds to the DNT molecule and induces a change in the RNA’s secondary structure, which enables transcription of an otherwise repressed protease. This enzyme then cleaves a bond between GFP and a nonfluorescent mutant yellow fluorescent protein, and thus unquenches the GFP fluorescence. A different concept for TNT detection was reported by Altamirano et al. (2004), who used two types of microalgae in a single assay. The toxic effect of TNT causes inhibition of the fluorescent signal emitted from PSII of the host organism. By measuring the difference in PSII fluorescence in the presence of TNT in a strain sensitive toward TNT and in a TNT-resistant mutant, the authors were able to detect as low as 0.5 mg/L of TNT after 3 min of exposure. An innovative approach was reported by Looger et al. (2003), who attempted to redesign the ribose-binding site of an E. coli ribose-binding protein to recognize TNT. This was apparently achieved by analysis of the protein’s high-resolution three-dimensional structure, and prediction of an amino acid sequence that will complement the structure of TNT. This design was integrated into a synthetic two-component signal transduction pathway in E. coli, with a very specific and sensitive response to TNT. This report, however, was later contested by Reimer et al. (2014), who demonstrated that no binding of the protein to TNT occurred, nor was any signal detected in response to TNT. Several other studies also reported the construction of microbes capable of detecting DNT and TNT (Garmendia et al. 2008; De Las Heras et al. 2008; de las Heras and de Lorenzo 2011b; Lönneborg et al. 2012; Kim et al. 2008; Tan et al. 2015). Harnessing such genetically engineered microbes for actual landmine detection was reported by Belkin et al. (2017). This study made use of E. coli-based bioreporters harboring a plasmid-borne fusion of a mutated yqjF gene promoter to gfpmut2 (Yagur-Kroll et al. 2014, 2015). The constructed bioreporter produced the fluorescent protein in the presence of TNT, DNT, and DNB. When encapsulated in alginate beads and spread over the test area, the fluorescent signal produced by the bacteria was measured by a laser-equipped telescope. This system successfully detected buried antipersonnel landmines buried in soil from a distance of 20 m. A schematic depiction of the detection concept is presented in Fig. 1. The increased consumption, and subsequent discharge, of either hormones or hormone-like substances to the environment has been a global concern for several decades, as have been that of diverse endocrine-disrupting compounds. The ineffectiveness of traditional wastewater treatment facilities in removing such substances, along with the significant biological effects even upon exposure to very small concentrations of estrogens, progesterones, androgens, and dioxin-like compounds (Luo et al. 2014), called for the development of new techniques for rapid detection of these substances. One of the techniques introduced over the past decade for this purpose is based on the use of genetically modified yeast strains. Yeast cells, which on the one hand are eukaryotic in structure but on the other hand lack endogenous hormone receptor elements, provide a robust sensor model which is superior to prokaryotic platforms when attempting to assess a potential threat to humans. A common design of a yeast-based biosensor for hormone detection (Fig. 2) includes the binding of the target to a constitutively expressed human hormone receptor (HR), thus allowing its binding to a hormone response element (HRE), which then drives expression of reporter genes (Tsai and O’Malley 1994). This concept, with mild variations, was successfully employed for diverse hormone receptors, including the human thyroid receptor (Li et al. 2008; Shiizaki et al. 2010), androgen receptor (Gaido et al. 1997; Eldridge et al. 2007; Michelini et al. 2008), glucocorticoid receptor (Wright and Gustafsson 1992), progesterone (Gaido et al. 1997; Klotz et al. 1997; Berg et al. 2000), and estrogen (Routledge and Sumpter 1996; Arnold et al. 1996; Gaido et al. 1997). Recently, a fungal-based estrogen bioreporter was also reported (Zutz et al. 2017), exhibiting improved performance with raw samples. In most of these cases, the inducible HRE is plasmid-borne, whereas the constitutive HR is either chromosomally integrated or is carried on a second plasmid. To address the issue of a potential imbalance in transcript copy number between the HR and the HRE, Miller et al. (2010) constructed a single-plasmid containing both the receptor element and the reporting element. This design was successfully applied for several hormone groups. An interesting approach for screening several hormone groups in a single assay was recently reported by Chamas et al. (2017a). Following sample separation via thin-layer chromatography, the plate containing the fractionated sample was immersed in a solution containing a modified Arxula adeninivorans bioreporter strain (Chamas et al. 2017b). This strain produces recombinant human progesterone, androgen, and estrogen receptors, with each response element coupled to a differently colored fluorescent reporter protein: cyan (CFP), green (GFP), and red (DsRed2). As a result, bands which contain compounds with progesterone, androgen, or estrogen activity will induce fluorescence of a different color in the A. adeninivorans overlay. However, this potentially multi-parallel detection test yielded poor reproducibility when analyzing environmental samples. 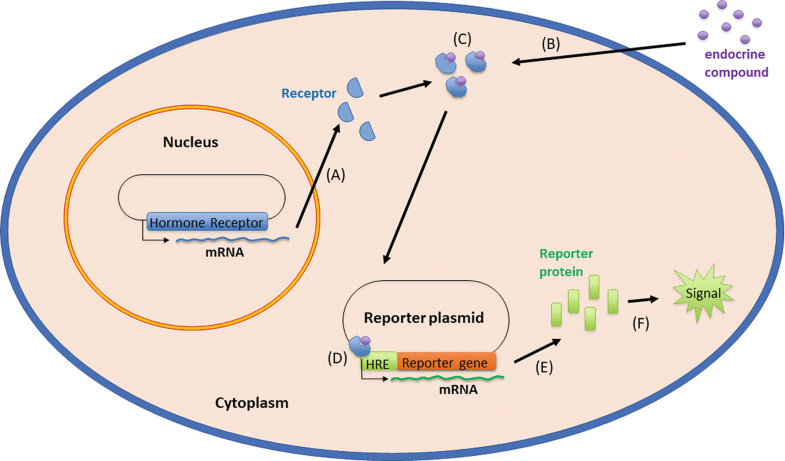 A different approach, employing E. coli cells that express the human estrogen receptor (ERα) on the cell’s surface (Furst et al. 2017), was recently suggested. This method uses an electrochemical electrode, modified with a protein that binds to ERα only when a target ligand is present. The binding of a target estrogen to the HR causes attachment of the bacterial cells to the electrode, which in turn causes a quantifiable change in impedance. This methodology allowed the detection of sub-ppb levels of estradiol and ppm levels of bisphenol A in a complex matrix, using very low sample volumes (10 μL). The increasing use of antibiotics in the food industry for both preventive and therapeutic purposes has led to a rise in public concern regarding the presence of residues of these compounds in consumer products. In addition to the undesirable and uncontrolled exposure to pharmaceuticals, this may increase the emergence and spreading of antibiotic resistance. One of the earliest attempts at constructing a microbial biosensor for detecting antibiotic residues was reported by Chopra et al. (1990). E. coli cells were transformed with a plasmid in which the tetA gene, encoding a tetracycline efflux pump which promotes the cell’s resistance to this antibiotic, was fused to an enzymatically active β-galactosidase segment. TetR, a repressor of tetA, is released upon exposure to tetracycline, which allows the transcription of tetA and thereby of lacZ. Korpela et al. (1998) employed a similar concept, by using the tetA-tetR complex, on a TN10 transposon, to push the transcription of the luxCDABE cassette of P. luminescens. The resulting strain specifically detected picomole amounts of several tetracyclines and was successfully employed to detect four tetracycline derivatives in poultry muscle tissue (Virolainen et al. 2008). A potential disadvantage of the TN10-controlled bioreporter reported by Korpela et al. (1998) lies in the fact that tetA transcription reduces intracellular tetracycline concentrations due to its efflux pump activity, thus mitigating the activity of the bioreporter. This was addressed by Bahl et al. (2005), who used the tetM gene of Enterococcus faecalis as a sensing element. This gene encodes a ribosomal protection protein, which allows the release of tetracycline from tetracycline-ribosome complexes and permits protein synthesis to occur. This mechanism ensures that tetracycline levels in the cell will not decrease and possibly even increase due to the release of tetracycline from tetracycline-ribosome complexes. By fusing tetM to gfp, the bioreporter successfully responded to concentrations ranging between 5 ng/mL and 16 μg/mL, a considerable improvement over previous antibiotic bioreporters. A bacterial biosensor for the detection of β-lactams was reported by Valtonen et al. (2002): an E. coli strain harboring a plasmid containing a fusion of the ampR regulatory element of Citrobacter freundii induced in the presence of β-lactams, to the luxCDABE cassette. The response toward various β-lactams was studied, and detection thresholds ranging from several ng to μg per mL were reported. The same strain was later used by Smolander et al. (2009) to detect novel substances with β-lactam activity in a high-throughput assay coupled to a support vector machine classifying algorithm. As antibiotic residues concentrations in food products or water samples are expected to be extremely low, lowering the detection threshold of microbial biosensors is not only desirable, but sometimes a requisite in the construction of a commercial biosensing platform. An interesting example was reported by Biran et al. (2011), who managed to increase the sensitivity of an E. coli based biosensor for the detection of DNA-damaging agents such nalidixic acid. The sensing-reporting elements of this reporter were the sulA gene promoter, involved in the cell’s SOS response, and the alkaline phosphatase-coding phoA gene. To increase its sensitivity toward the target analytes, several gene deletions were introduced in the host genome: rfaE (enhancing membrane permeability), umuD, and uvrA (inhibiting DNA damage repair mechanisms). Certain combinations of these deletion mutations caused a significant increase in the reporter’s sensitivity toward nalidixic acid. Melamed et al. (2012) analyzed the response pattern of a panel of microbial bioreporters, each responding to a different group of antibiotics, and defined a typical response pattern for each of the antibiotics groups tested. This allowed to successfully detect and categorize samples containing “unknown” antibiotics at varying concentrations. Further enhancement of this panel’s capabilities was obtained by altering the cell’s membrane permeability and efflux capacity, which resulted in a lower detection threshold for several antibiotics (Melamed et al. 2014). One member of this panel, carrying a plasmid-borne recA::luxCDABE fusion, was later incorporated into a biosensor device for the detection of ciprofloxacin residues in food (Kao et al. 2018). Due to their extensive use in agriculture, pesticide residues, many of them highly persistent, are commonly found in soil, in surface and groundwaters, in plant and wildlife tissues, and sometimes in food products (Alavanja 2009). Coupled with the well documented acute and chronic health effects of some pesticides (Rosenstock et al. 1991; Alavanja et al. 2004; Sanborn et al. 2012), the need for cost-effective, easy, and rapid detection systems is obvious. A simple design for an organophosphate microbial biosensor was suggested two decades ago by Rainina et al. (1996). This system is based on an E. coli host cell, harboring the organophosphate hydrolase (OPH) gene of Pseudomonas diminuta. This gene encodes an enzyme which hydrolyzes p-nitrophenyl derivatives to p-nitrophenol, which is then degraded by the cell’s native metabolism. Electrode-based enzymatic biosensors based on this enzyme were studied extensively (Mulchandani et al. 1999, 2001a, b, c). While simple to use, this reporter exhibited relatively high detection thresholds for the target analytes (250 ppb for paraoxon), probably due to mass transport resistance across the periplasmic and cytoplasmic membranes. A similar E. coli-based design was applied by Mulchandani et al. (1998) and immobilized on a pH electrode. The resulting device detected 2 μM of paraoxon, methyl parathion, and diazinon and allowed multiple uses of the same electrode. An attempt to improve the performance of OPH-based biosensors was reported by Lei et al. (2005), who used P. putida, a natural p-nitrophenol degrader, as host and immobilized the cells on a carbon-paste electrode. By measuring the electrooxidization current created by the intermediates, detection threshold of ca. 0.3 ppb for all three tested organophosphates (paraoxon, methyl parathion, and parathion) was obtained, with good selectivity. Recently, a similar concept for the detection of p-nitrophenyl-substituted organophosphates was reported by Tang et al. (2014), making use of an E. coli strain genetically engineered to express OPH on its outer membrane. The cells were immobilized on a glass carbon electrode modified with ordered mesoporous carbons. The assay’s sensitivity was improved by using an OPH mutant with improved stability and enzymatic activity. This design allowed detection of 9 nM paraoxon, 10 nM parathion, and 15 nM methyl parathion. In a recent report, the construction of a microbial biosensor capable of directly responding to organophosphates by using the transcription regulator DmpR (Chong and Ching 2016) was described. This molecule is activated by various methyl phenols, and a mutated version of it also responds to 4-nitrophenol, a common hydrolysis product of organophosphates. The transcription of the dmpR promoter was coupled to mRFP1, resulting in red fluorescence in the presence of parathion, methyl-parathion, and fenitrothion. Random mutagenesis was employed to enhance the sensitivity of the dmpR promoter, yielding two dmpR mutants with improved sensitivity. Lindane (hexachlorocyclohexane, HCH) is an organochlorine insecticide which is a major environmental contaminant (Phillips et al. 2005). It acts as a neurotoxin by blocking the GABA-gated chloride channel and reducing neuronal inhibition, which results in hyperexcitation of the central nervous system (Bloomquist 1993). The high toxicity and carcinogenicity in humans of lindane (Loomis et al. 2015), renders it an important target for development of rapid and sensitive detection systems. A microbial biosensor for the detection of lindane was reported by Anu Prathap et al. (2012). This bioreporter is based on an E. coli host with the Sphingomonas paucimobilis linA2 HCH dehydrochlorinase overexpressed using the T7 strong inducible promoter. This gene is involved in the initial steps of lindane biotransformation through a three-step dehydrochlorination, which leads to the release of hydrochloric acid (HCl). The authors used polyaniline as a pH transducer; upon protonation by the excreted HCl, its conductivity is increased by up to 10 orders of magnitude. By using pulsed amperometry, lindane concentrations as low as 2 ppt were detected. López Rodriguez et al. (2015) also used a lindane-degrading microbe as a platform for developing a microbial biosensor for this pesticide. Streptomyces strain M7 (SM7), isolated from a pesticide-contaminated soil, is capable of growing with lindane as the sole carbon source (Benimeli et al. 2007). By use of impedimetric analysis to measure the variation in metabolic activity in the presence of lindane, the authors were able to detect changes as low as 120 μg/L in lindane concentration in a liquid matrix. An attractive advantage of this development is the use of bacterial spores as the recognition element (López Rodriguez et al. 2014), adding to the robustness and durability of the assay. Hua et al. (2015) reported a successful E. coli-based assay for the detection of atrazine and its degradation product cyanuric acid. Two bioluminescent reporter strains were developed, one for both compounds and the other for cyanuric acid only, employing different Pseudomonas sp. pADP-1 atz gene promoters as the sensing elements. Cyanuric acid detection limits were reported to comply with WHO recommendations for this compound. Photosynthetic organisms, such as microalgae, have also been studied as biosensors of agrochemicals. 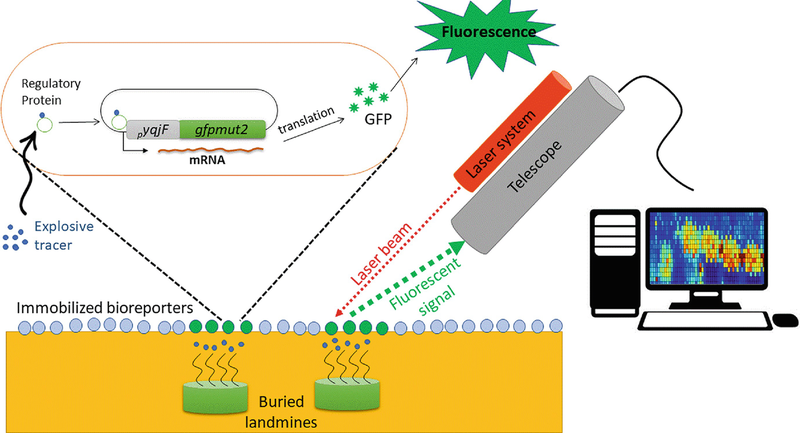 A simple design consists of measuring the chlorophyll fluorescence at 682 nm, which increases upon exposure to toxicants that inhibit photosystem II (Merz et al. 1996). This design was applied with various hosts and herbicides, including atrazine, endrine, simazine, diuron, dinitro-ortho-cresol (DNOC), and isoproturon (Frense et al. 1998; Naessens et al. 2000; Védrine et al. 2003). As such sensors detect all PSII-targeting pesticides, their specificity is limited. This issue was addressed by Peña-Vázquez et al. (2009), who obtained simazine specificity by combining, in a solgel matrix, sensor strains with different sensitivities to this herbicide. This design follows the concept reported by Altamirano et al. (2004) for improving a reporter’s specificity toward TNT, reviewed earlier in this chapter. Acetylcholinesterase (AChE) inhibition assays for the detection and quantification of organophosphates and carbamates, both inhibitors of this enzyme, are well documented (Villatte et al. 1998). It has been shown that insect AChE is more sensitive than the mammalian one (Villatte et al. 1998). However, purification of this enzyme is costly and time-consuming. To overcome this difficulty, Li et al. (2013) used S. cerevisiae to express the Drosophila melanogaster AChE on the cell’s surface. This strain was used as an immobilized platform, and AChE inhibition was measured in a commercially available colorimetric kit (Ellman et al. 1961), successfully and sensitively detecting organophosphates and carbamates. Halogenated organic compounds (HOCs) are members of a large group of organic substances used extensively in agriculture (herbicides, insecticides, and fungicides), in diverse industries (solvents, process components, and byproducts), and in water treatment (chlorination byproducts). Chlorinated and brominated polycyclic compounds have favorable attributes in terms of stability at high temperatures and hydraulic and electrical properties. Unfortunately, these attributes are also related to accumulation in fatty tissues, low environmental mobility, and low biodegradability for many of the members of this group (Pearson 1982). This has led to the large number of HOCs in the US Environmental Protection Agency’s “Priority Pollutant List” (U.S. Environmental Protection Agency 1972, 2014). While many HOCs are highly recalcitrant, some organisms are capable either partial or full mineralization of certain members of this group. For the most part, biodegradation processes of HOCs are initiated by the cleavage of the carbon-halogen bond by dehalogenases (Fetzner and Lingens 1994). One such enzyme, the Arthrobacter SU 4-chlorobenzoic acid (4CBA) dehalogenase, was employed by Rozen et al. (1999) to construct a bioreporter for the detection of 4CBA. The gene encoding this enzyme, fcbA, was fused to the A. fischeri luxCDABE genes and transformed via plasmid to an E. coli host. The resulting strain detected 60 mg/L of 4CBA with rather good specificity. The detection limits of this bioreporter were significantly improved (28 μM of 4CBA, equivalent to 4.3 mg/L) when a membrane-leaky mutant was used as host and immobilized in alginate beads (Köhler et al. 2000). A similar approach was used by Tauber et al. (2001) to design a bioreporter for detecting 2-chloropropionic acid (2-CPA). The promoter region of the DL-DEX dehalogenase of a Pseudomonas sp., encoding for an enzyme responsible for the dehalogenation of DL-2-haloalkanoic acids, was fused to the luxCDABE genes of P. luminescens and transformed via plasmid to an E. coli host. While exhibiting good dose-dependency, the sensitivity of the constructed bioreporter was low, with a detection threshold of 100 mg/L. Hutter et al. (1995) employed a different approach to detect halogenated hydrocarbons. This design used the innate ability of a Rhodococcus strain containing an alkyl-halidohydrolase, an enzyme which removes halogen ions from halogenated hydrocarbons. Once free, these ions are quantified using ion sensitive potentiometric chloride or bromide electrodes. Using this method, the authors were able to detect 50 μg/L of chlorinated hydrocarbons and 10 μg/L of brominated hydrocarbons. The methodology was later improved by immobilizing the bacteria directly on the electrode’s surface (Peter et al. 1996). Another attempt to use microbial biosensors to detect halogenated hydrocarbons was reported by Han et al. (2001), who used Pseudomonas aeruginosa JI 104 to detect trichloroethylene (TCE). This strain, isolated from soil near a gasworks, is capable of full mineralization of TCE, during which the chloride ion is released. Quantification of TCE was performed by coupling the activity of this bacterium to a chloride ion electrode. A dose-dependent response was observed, with a detection threshold of 0.1 mg/L TCE. However, the device exhibited a very limited shelf life; activity was reduced by 50% after 3 days. More recently, an interesting approach was applied to detect TCE by immobilizing a P. putida strain to a surface of gold interdigitated microelectrode (Hnaien et al. 2011). This strain degrades TCE to glyoxylate and formate by a toluene dioxygenase (TOD) enzyme. The design consisted of two electrodes; the working electrode, onto which the wild-type strain was immobilized, and the reference electrode, on which was immobilized a TOD-defective strain. Upon exposure to the target analyte, formate and glyoxylate are formed in the working electrode but not in the reference electrode. Quantification is achieved by measuring the conductance differences between the electrodes. Using this design, a rapid, dose-dependent response to TCE was observed, with a detection threshold of 0.07 μM. In addition, shelf life was shown to be superior to previous designs, maintaining 92% activity after 7 weeks of storage. Polychlorinated biphenyls (PCBs), banned from use in many countries several decades ago, are still prevalent environmental pollutants. Many studies reported the high toxicity of PCBs and their transformation products, leading to a great interest in the development of new detection techniques. A bioreporter for the detection of PCBs was first reported by Layton et al. (1998), who fused the bphA1 gene promoter region, encoding the subunit alpha of the biphenyl dioxygenase of the PCB-degrading strain Cupriavidus necator (formerly known as Ralstonia eutropha), to the A. fischeri luxCDABE genes. This fusion was transformed via plasmid to an E. coli host, and the resulting strain was able to detect 0.15 mg/L of 4-chlorobiphenyl and 1.5 mg/L of Aroclor. Another approach for PCBs detection was reported by Gavlasova et al. (2008), who immobilized a Pseudomonas sp. in a silica gel matrix. The catabolic process by which this bacterium degrades PCBs includes the formation of a yellow metabolite which absorbs light at 398 nm. By monitoring the formation of this metabolite, the authors were able to detect 2,3,4′-trichlorobiphenyl, 2,4,4′-trichlorobiphenyl, and 2,5,4′-trichlorobiphenyl with a detection threshold of 0.2–0.5 mg/L. The ability of this bioreporter to detect PCBs in mineral oil and soil originating from a landfill was also tested with satisfactory results. As clearly emerges from the information provided in this chapter, a large variety of microorganisms have been molecularly engineered as live bioreporters of diverse organic compounds of environmental and health-related significance. Impressive ingenuity is displayed regarding the microbiological and molecular approaches employed to achieve this end, employing laboratory “workhorses” such as E. coli or S. cerevisiae, but also isolates from niche ecosystems, such as the fungus Y. lipolytica. With the ever-increasing availability of yet more sophisticated synthetic biology and computational tools, it is easy to predict that this trend will continue into the near future. Another facet of the topic that may be gleaned from what is portrayed in this review, is actually hinted at by what it does not include: in spite of the remarkable array of sensor systems described above, and of the spectrum of deleterious chemicals they can detect, almost none of them has been adopted by regulatory authorities as recommended monitoring tools. A part of this phenomenon may be explained by the necessary conservativism of environmental regulations, and the long timelines required for the introduction, acceptance, and commercialization of new methodologies. Just as important, however, is that many of the reports are satisfied with a description of a potentially successful sensor and its preliminary characterization, reporting a validation of a concept which is not yet suitable as a basis for a real application. One can only hope that in the future we will see more of the rigorous characterization efforts involved in the development of such an application, along with a parallel development of the hardware required for its implementation as a robust and commercially viable tool.